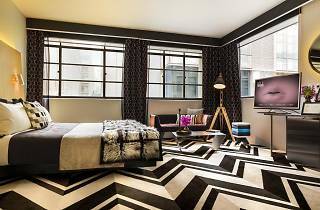 Located within a hulking 1938 building on the busy CBD hotspot that is Flinders Lane, the Adelphi Hotel is a nice landing spot for those who value edgy design, location and first-rate service. The Adelphi is a uniquely styled boutique hotel, from its signature zig-zagged floor right down to the ubiquitous lolly jars in every room. Redesigned in 2013 by Hachem, the hotel might not be as sophisticated as its neighbouring Westin Hotel, but that lack of stuffiness works to the Adelphi’s advantage, especially considering you’re sharing walls with some of the city’s hottest restaurants. 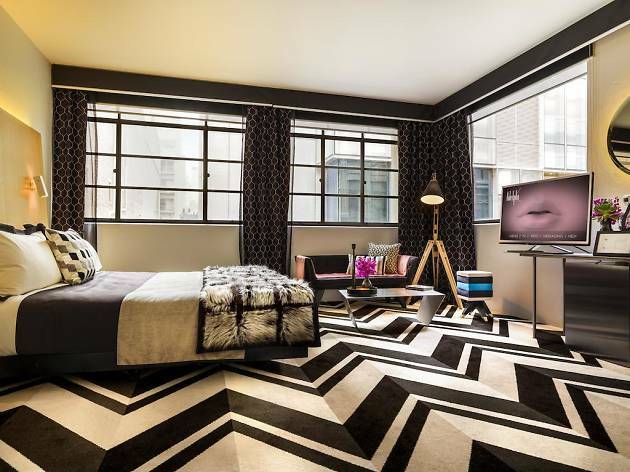 With only 34 rooms, the Adelphi can afford to be a little playful in design. Kitschy lamps, furry rugs and not-very-functional-but-still-cute couches line the corners of rooms, with the centrepiece king-sized bed a comfy standout. The brightly hued rooms also come with 40-inch flat screens (with unlimited movies), spacious bathrooms with rainfall shower heads and minibars full of free snacks and non-alcoholic drinks. Peckish? You're in luck. Staying at the Adelphi means you're seconds from Japanese diner Supernormal, the French-Vietnamese Coda and arguably the city's busiest restaurant, Chin Chin (if you don't mind the queues!). Downstairs at the Adelphi is also a sweet tooth's paradise thanks to Om Nom Dessert Restaurant. We’d be remiss if we didn’t talk about the rooftop. The Adelphi’s rooftop pool is probably one of the most photographed pools in Melbourne, thanks to its cantilevering, glass-bottom, which juts out over Flinders Lane. It's open from 6am most days if you're one for an early-morning swim, otherwise Friday evening is perfect for a swim and an after-work cocktail. Time Out tip: Do keep in mind that you are on a bustling CBD street and noise travels remarkably well up those cobblestone laneways. Bring your earplugs if you want a solid night's sleep.